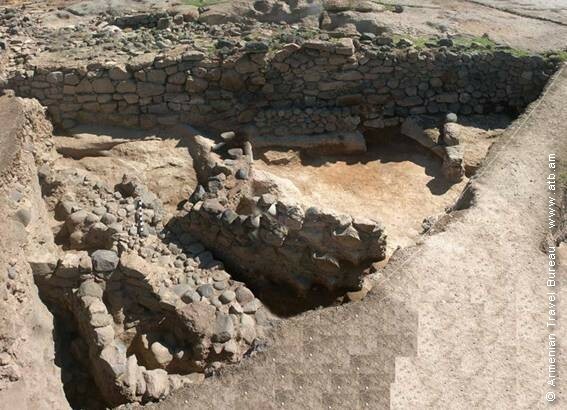 Il territorio dell’Armenia è piena dei reperti archeologici e monumenti storici - architettonici. Avrete l’opportunità della conoscenza e padronanza delle nuove tecnologie, dai sistemi di rilevamento e dalle metodologie di analisi ambientale, nonchè vi daremo l’opportunità unica di partecipare al recupero e lo studio dei reperti, ricostituire una cultura organica dell’antico attraverso i corsi di storia, storia dell’arte antica, archeologia e le escursioni organizzati. 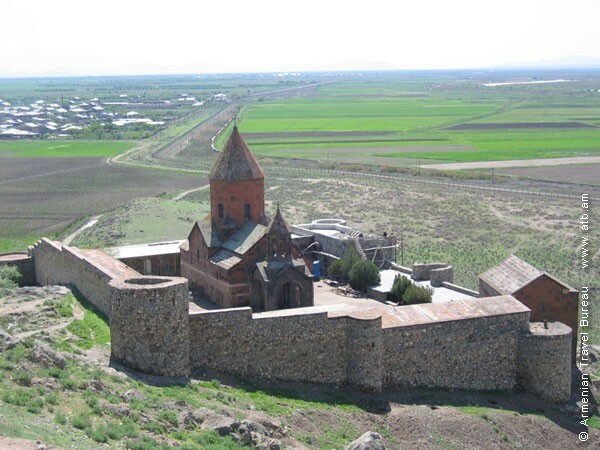 A trip to Ararat valley with a visit to Khor Virap Monastery. The complex of monastery-castle is located in the place of the citadel of historical capital Artashat, to left of the river Arax, on the homonymic hills. Once there was Artashat citadel here, which included the royal prison-casemate. 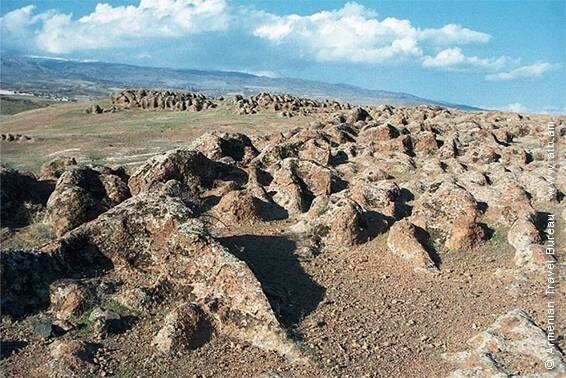 That’s why it was called «Virap Artashatu» - the pit of Artashat. According to the legend told by Vth century A.D. historian Agatangeghos it is connected with the name of Grigor Lusavorich (Gregory the Illuminator), who bore his tortures here. The monastery complex includes 2 churches. The first is St. Grigor church, built by Nerses III the Builder in 642. 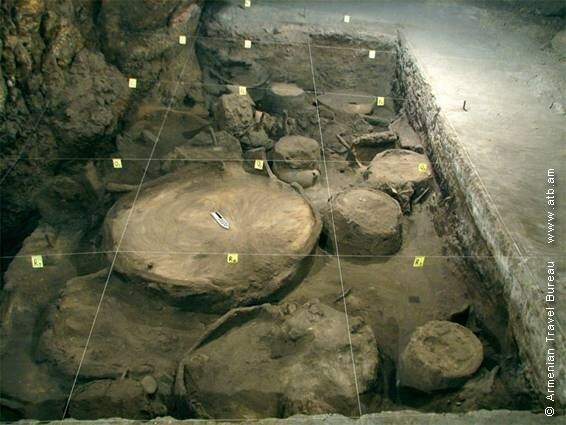 Here is a pit 4,4 and 6 metres deep with dome-shaped covering. 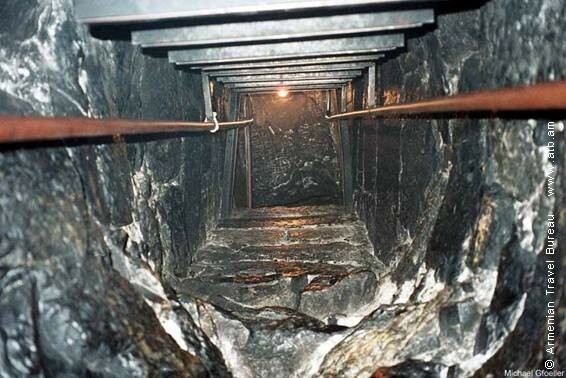 The ladder of 25 stairs leads people to this depth. The church was first renovated in 1661, then in 1879 after the earthquake. The other is St. Astvatsatsin church founded at the end of the 17th century. The church is a domed construction with an adjacent belfry. The monastery is surrounded with a wall, with chambers, storehouses, inns, cattle sheds and other buildings attached. 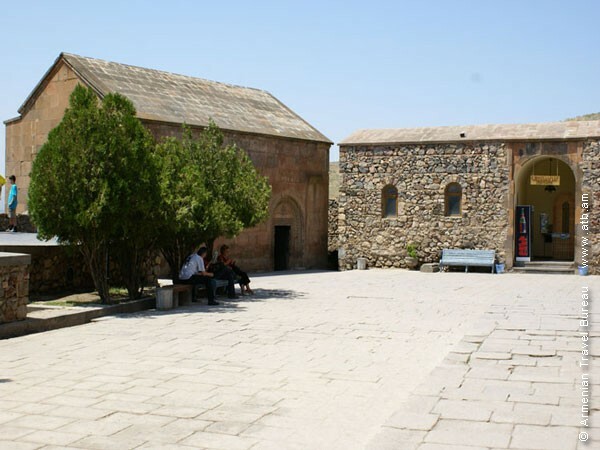 Khor Virap has been a scholastic centre – a place of pilgrimage. 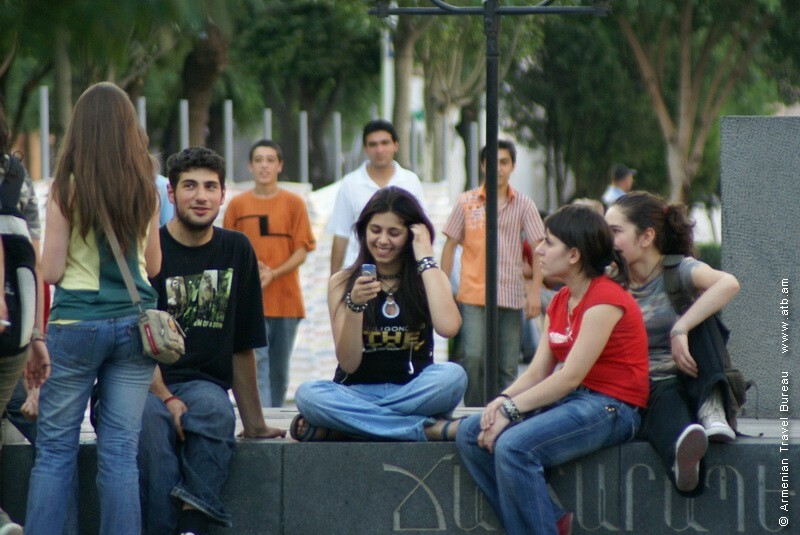 The 13 th century famous historiographer Vardan Areveltsi founded a school with 40 students studying here. In the 18 th century the monastery became deserted for a long period, and only in 1765 Catholikos Simeon of Yerevan managed to bring it to life. We have received more than ten manuscripts as a heritage from this scholastic centre. Nowadays the monastic complex is entirely renovated. Proceeding to Areni village. Lunch. Areni village in Vayots Dzor province is one of the oldest and outstanding settlements in Vayots Dzor province of Syunik Marz in historical Great Armenia. It is located on the right bank of the river Arpa, on the rim of its gorge, crossing which the river flows through a narrow canyon out in Sharur valley. In other words the settlement has been a road junction and military point protecting the canyon between Sharur valley and Vayots Dzor. Continuing to Noravank Monastery which is one of the well-known monasteries in Syunik Province, located on a height, on the right bank of the river Amaghu - the left tributary of the river Arpa. The exact foundation date of the monastery is not known. There are a number of records about it already in the 12th century. The monastery has possessed abundant estates. 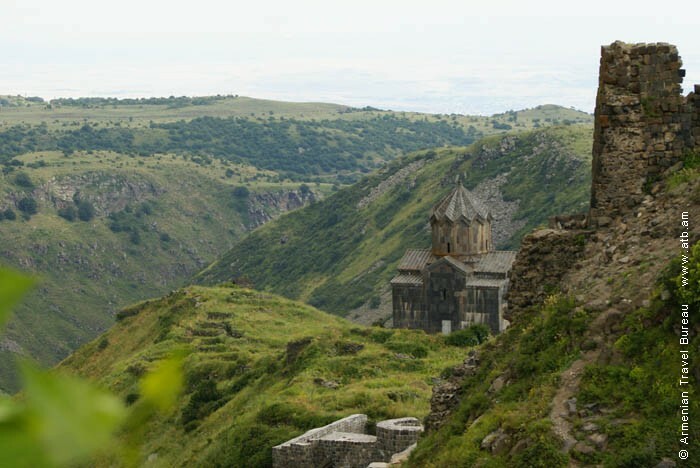 It was an episcopal residence – its bishops and other clergymen periodically struggled against Tatev monastery to maintain independence.The architectural complex of the monastery was established in the 13 -14th centuries. 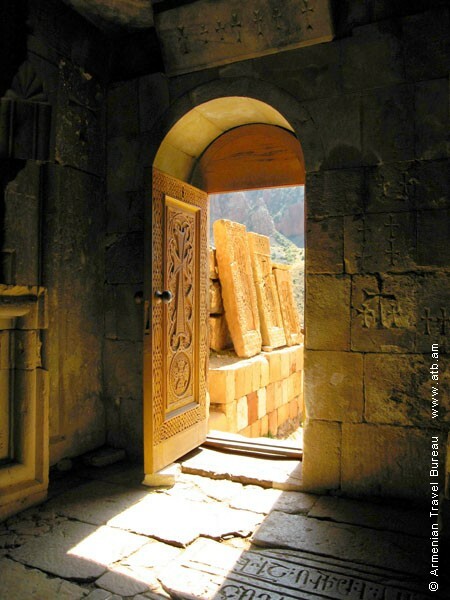 In the 13th century it was already the holy centre of Syunik – the family burial vault of Orbelyan princes. Here are buried many of Orbelyan princes, as well as bishops. Among them we can also mention the great historiographer Stepanos Orbelyan. Noravank is a complicated and highly artistic architectural complex. The monastic complex includes 11-12th c. St. Karapet and St. Pokas churches –not preserved, St. Karapet principal church, its affiliated “gavit” (churchvestibule ), sepulcher of prince Smbat, Burtelashen church, two chapels and different types of edifices, rampart, beyond which there is a spring. St. Karapet church was built in 1213 -1223 by the request of Liparit Orbelyan prince. 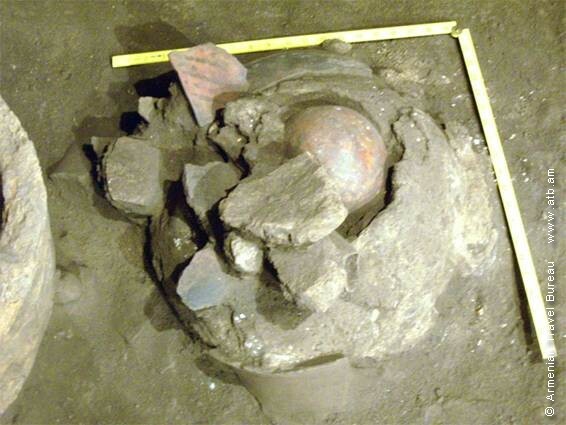 It’s a domed construction with a cruciform interior. The gavit is adjoined to the west, built immediately after the church – several times undergoing some restorations. In 1261 it was renovated by the architect Siranes on Smbat Orbelyan’s errand. The next restoration was probably completed by the architect Momik in the first half of the 14th century. 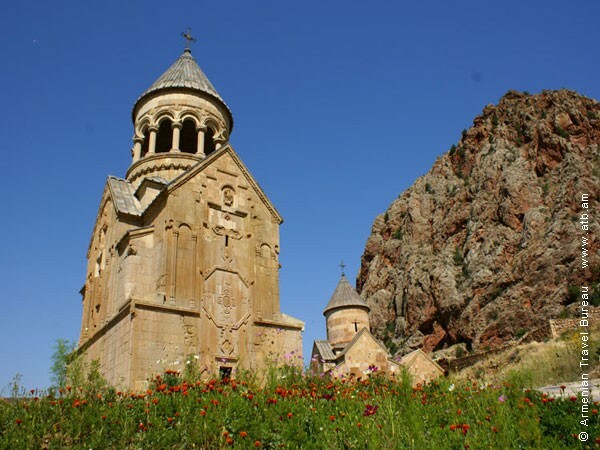 Among the edifices of the monastic complex with its significance a particular interest arouses the sepulcher-church of prince Burtel, also called Burtelashen or St. Astvatsatsin erected by Momik. It’s one of the jewels of the 14th c. Armenian architecture. The church is two-storey building covered with highly artistic reliefs. The church bas-reliefs show the Holy Virgin with the Child, sitting on a throne, Burtel prince holding a model of the temple, etc. The half-ruined wall – the remains of the inner and outer edifices were constructed in 17-18th centuries. In the 13th century a guest-house was built in the monastic complex. 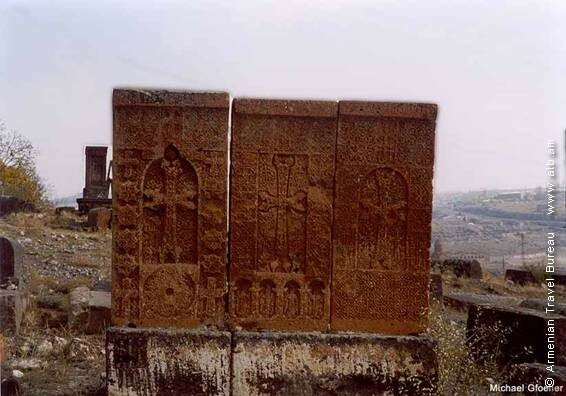 There are various khachkars (cross-stones) in the area of the complex, among which arrest attention those created by Momik. The various records preserved on the walls of the monastic edifices provide with interesting information not only about spiritual but also about temporal life. Noravank has been a grand cultural centre. The architect Siranes and the remarkable miniature painter and sculptor Momik –the famous graduate of Gladzor University, worked here in the latter part of the thirteenth and early fourteenth century. The outstanding representative of the Orbelyan Princes dynasty, historiographer Stepanos Orbelyan also worked in this monastery. He completed here his famous work «History of Sisakan Province». It gives valuable facts about political, particularly social-economic life of Syunik and of the neighboring countries of all Armenia. Nowadays the complex is entirely renovated. Continuing the trip to Yeghegis village. Yeghegis village in Vayots Dzor Marz is also one of the oldest settlements in Vayots Dzor region of the Syunik province. In different periods it has been a settlement of different types: a village, a burg, a country town, a fortress town, even a capital as it was called during the period of its being prince residence in 10 -13th centuries. 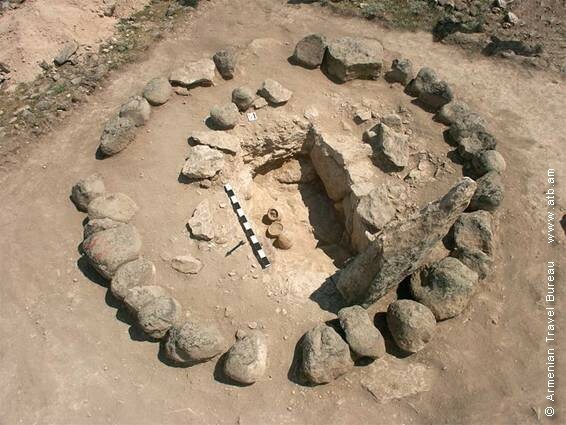 The foundation period isn’t known, yet judging by the antiquities of the territory, Yeghegis might have been an ordinary country-town before the 9th century, i.e. before becoming the Syunik princes’ residence instead of Shaghat country-town, then it gradually changed, renovated, got larger – became country-town or town. Probably it was the time (9th c.) of its citadel establishment, as the local residents call it - Smbataberd, by which the country-town along with its citadel were mainly meant. Yet they were separate units disjoined at a distance of 1-2km, like Kapan town and its citadel-Baghaberd. The main settlement of Yeghegis lies in the valley of the right tributary of the river Arpa –Yeghegis, in the area of the present-day village, as well as in the area of Hostun ruined settlement. The country town, consequently, spread in a narrow strip of 4- 4,5km length across the right-bank valley of the river Yeghegis. The citadel or Smbataberd was situated to the north-west from the main settlement, on the high mountain between two deep canyons. 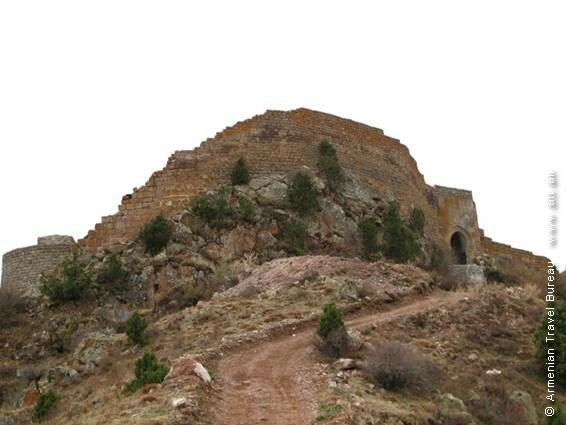 Yeghegis along with its citadel became the residence of Syunik rulers. 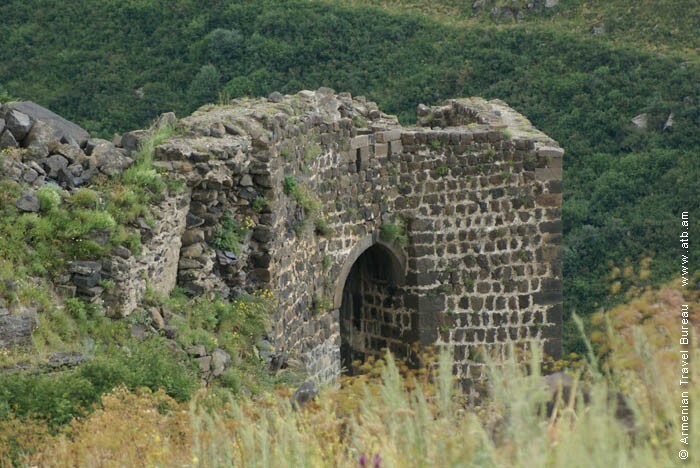 After the decay of Bagratunyats Kingdom (1045) the princes of Vayots Dzor lost their political importance. Gradually the Orbelyans took over gaining large estates, establishing own power. 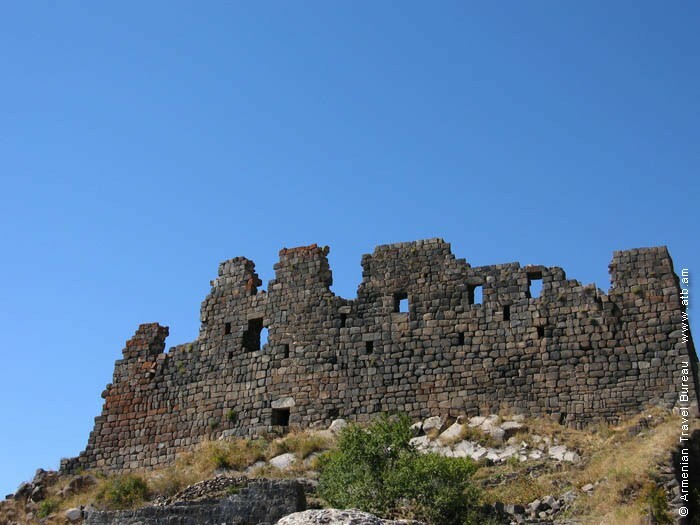 They made Yeghegis their residence after renovating, making it more fascinating and fortifying its fortress. In the reign of both the Syunik Princes and their successors –Orbelyans, there were founded in Yeghegis citadel magnificent edifices, the ruins of the most of which have survived up to now. The ruins of Smbataberd are grandiose, particularly well-preserved walls. The main fortress on the peak of the hill was all around surrounded with those strong walls of 2,2-4,3- meter thickness. The fortress had 10-11 m high 11 towers. The walls are constructed with polished, unwrought stones, by mortar. 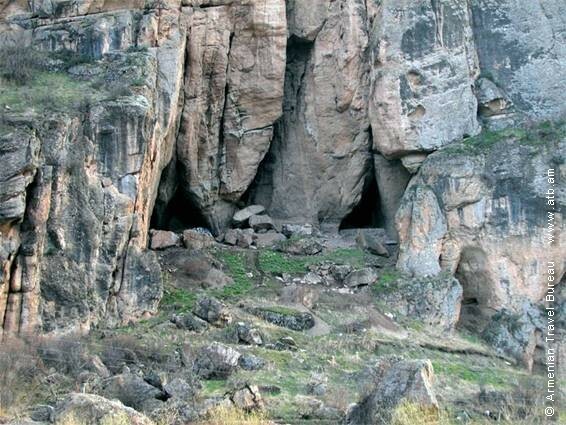 It was considered one of the impregnable strongholds in Syunik. During its existence the fortress was besieged a number of times but it always remained impregnable. It had 3 entrances the main of which was to the north – from where one could enter the fortress. The inner edifices of the fortress are not well-preserved. Those edifices were used as palace rooms, barracks, arsenals, other defensive constructions. The fortress also possessed its own water supply system. 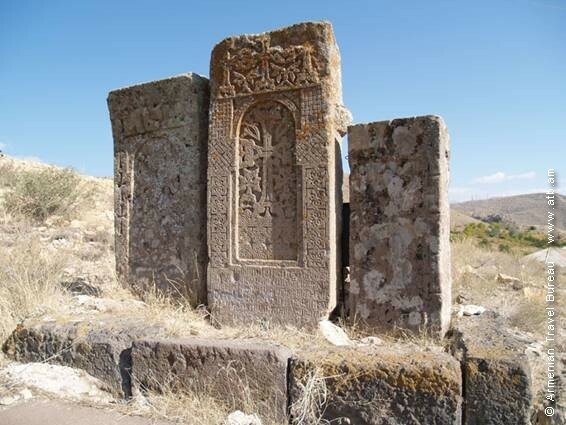 Among the important monuments survived in the village area (in the main country town) are Zorats church (14th c.), St. Astvatsatsin basilica (survived after the restoration of 1703), St. Karapet domed church (13th c.), various khachkars of 10-14th centuries, the family burial vault of Orbelyan princes (13 th c.). Proceeding to Lake Sevan across the Selim pass. Dinner at Lake Sevan in Harsnakar restaurant. Back to Yerevan. Overnight in hotel. The town stretches out on the wide plain of either banks of the river Kasakh. 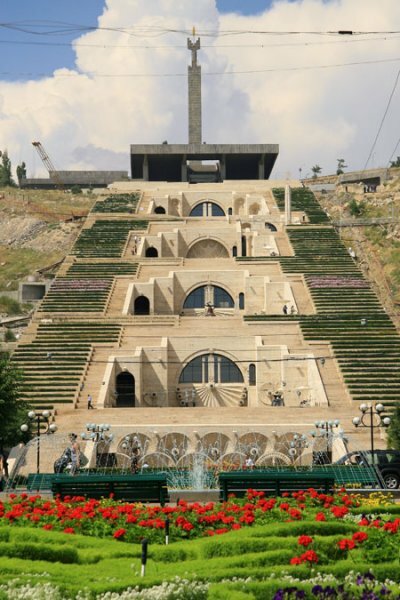 The name is connected with an Armenian word «ashtarak» (tower), while according to some notions it comes from the name of the Babylonian -Assyrian Goddess - Ishtar. In the Armenian sources it has been mentioned since 9th century as one of the settlements of Aragatsotn district of Ayrarat province in Great Armenia. 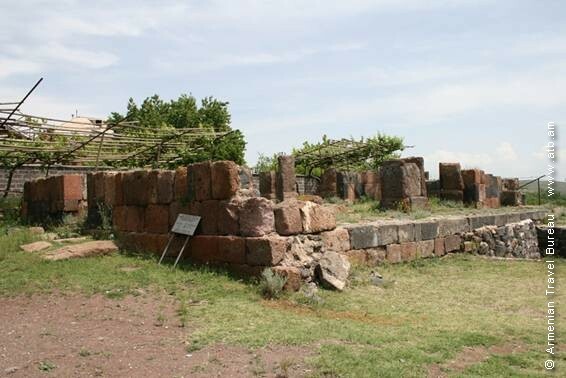 Moreover, the existing large quantity of Bronze- Iron Age monuments (castle-settlements, tomb fields, etc) indicates that Ashtarak is one of the oldest settlements in Armenia. Generally, Ashtarak is endowed with archaeological, historical-architectural monuments, which form an impressive complete complex together with the picturesque landscape of the gorge of the river Kasakh, flowing across the city. 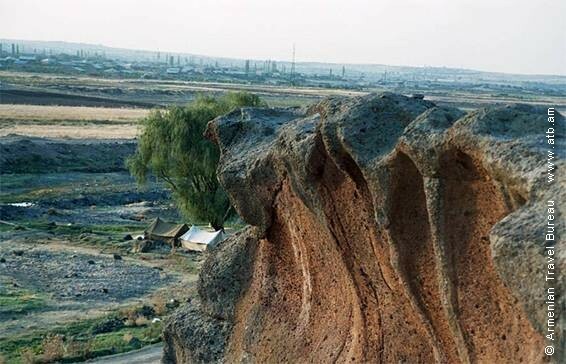 Thus, lying next to the new bridge passing around the town, to the right of Yerevan – Gyumri highway, on the left bank of the river Kasakh, there are the remains of a settlement survived from the Bronz Age up to the Middle Ages (the locals call the place –Darabavor). 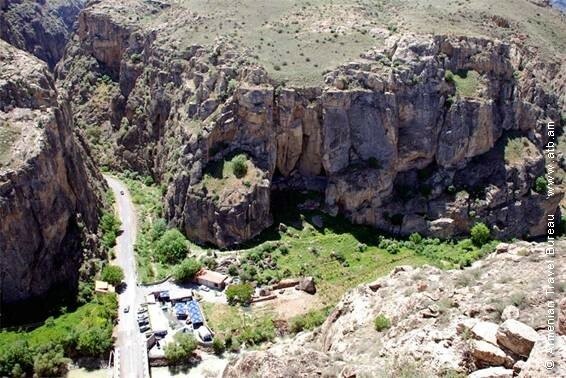 The famous caves of Darabavor are located in the canyon, just next to the settlement. These caves have been in use since ancient times. 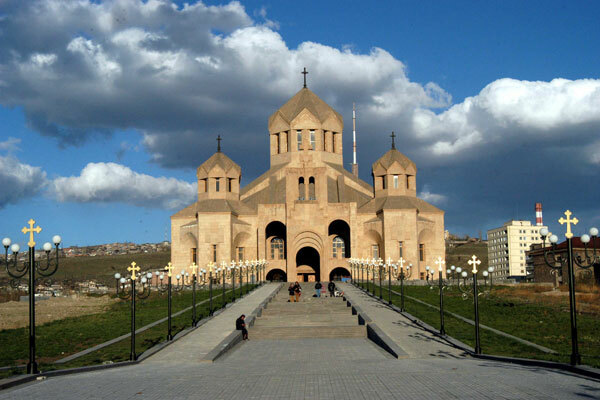 One of the best examples of the early Christian - period Armenian architecture is three-nave basilica –Tsiranavor built in the 5th century. In the 18th century its outer double walls were constructed in order to fortify the church. The natives call «Berdatagh» the area around Tsiranavaor. The most popular construction of the town is Karmravor church of St. Astvatsatsin – one of the gems of the 7th century Armenian architecture. 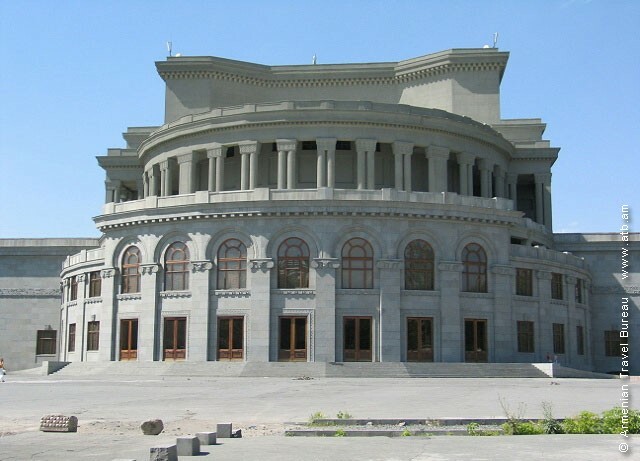 It’s a centre-domical old building, as well as the earliest tile-roofed building survived in Armenia. The church of St. Marine or St. Mariane (1281) is nestled in the city centre - a domed-hall shaped edifice, which was surrounded with high stone walls in the past. Spitakavor church (13 – 14th) is quadrangle in plan, with vaulted covering, located on the peak of the cliff in «Berdatagh». Among the remarkable edifices the three-arched, stone bridge of Kasakh has its significant position. It was established by an opulent from Kanaker- Mahtes Khoja Grigor in 1664 in the place of an older bridge (12-13th cc.). The bridge is 76 m. long, and about 6 m. wide, built of a polished apricot tuff, with a builder’s inscription in the front. The new church of St. Sargis founded in the place of ancient basis, is situated on the left bank of the canyon, above the bridge. Among the various expressive monuments existing in the town there are as well the irrigation ditch called Akanatesi aru ( Witness’ stream) having functioned from the Urartian period up to the Middle Ages, the well-preserved examples of the ethnographic houses built in the late 19th – 20th c., the water-mill built in the adjoining territory of the bridge in the 19th century, still in use, the separately grouped khachkars (the most part is in the civil cemetery), the largest and the most popular of which is the cross of St. Nshan or Hole cross, located on a pedestal by Tovmas priest in 1268, etc. Archaeological trip to the ancient settlement of Agarak. Lying in the southern foothills of Mt. 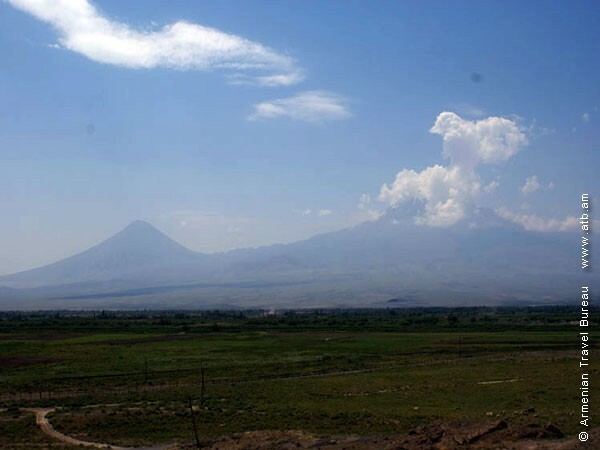 Aragats , on the western bank of the Amberd River the site of Agarak covers an area of 200 hectares, a portion of which (118 hectares) has now been declared a historical and cultural preserve by the government of Armenia. Proceeding to Aghtsk village. Lunch . 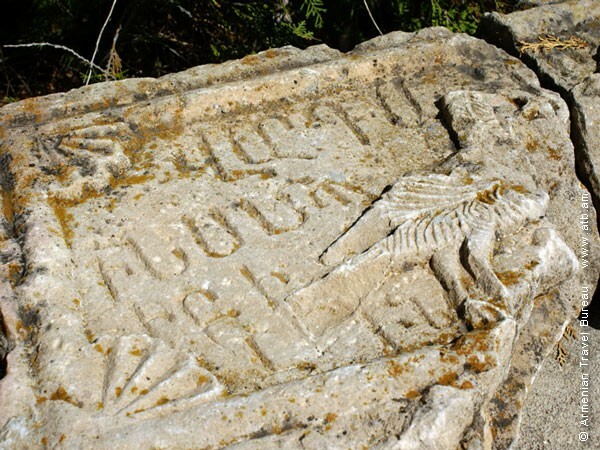 The tourists will find the sepulcher of the Armenian Arshakuni Kings located in Aghtsk village of Aragatsotn province, on the high terrace of the gorge of the river Amberd. A tetragonal, three- nave hall church is added to the North of the royal sepulcher. The church constructed of polished black, yellowish tuff by means of mortar, has been considerably demolished. Only the basis of the walls have survived, separate fragments decorated with bas-reliefs and inscriptions, as well as the debris of later established khachkars and relics have survived. On the southern and northern sides of the horseshoe-shaped altar there are the side-chapels. The church structure, types of the column feet, ornamentations are archaic, typical of the oldest Christian churches, like Tsitsernavank, Tsiranavor in Ashtarak, Yereruik, etc, which gives ground to date Aghtsk to the 4th c.
The works of historians Movses Khorenatsi and Pavstos Buzand contain authentic information about the construction of Aghtsk royal sepulcher, according to which the sepulcher was founded in the period of the Armenian-Persian war, immediately after the raid undertaken by the Persian king Shapuh the II in 359. 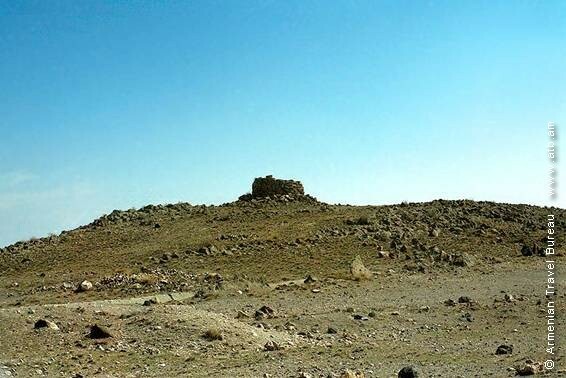 According to Buzand the king Shapuh has invaded in Armenia by a sudden attack, and going deep into the country has conquered Ani castle in Daranagh province, where the royal sepulchers were settled. The Persians open the royal sepulchers gathering the kings’ bones, take them, thinking that in this way they take away the power and the strength of the country. Learning about this Armenian commander - in –chief Vasak Mamikonyan organizes a sudden attack, retakes the hostages and the kings’ bones, finally buries them in Aghtsk village, which was in one of the inaccessible and narrowest cavities of Mount Aragats. The subterranean part of the Arshakuni Kings’ sepulcher has a rectangular structure from outside, and a cruciform structure from inside (2,60x 3,80 m). It’s constructed of black-red tuff polished stones by means of mortar. It has an orientation to the West-East. The abside is in the East, while in the central point of southern-northern longitudinal walls there are rectangular niches covered with horseshoe –shaped vaults, where the Arshakuni Kings’ bones are buried. The niche orifices are closed by red-black tuff thin plates fixed in a special groove, the façades of which are decorated with both mythological and Biblical old bas-reliefs. The schemed bas-reliefs are deprived of any thorough elaboration, yet they have expressiveness typical of early medieval sculptures. There is a vaulted threshold to the West, which embrasure is bordered from above with tympanum stones, with a semicircular stone ornamented stone on, fringed with unloading arch with bas-reliefs of diverse chases. The columns on either sides of the entrance are also decorated with bas-reliefs of in lined crosses and chases. The sepulcher block is covered with mortar, which once bore the weight of the second floor-the prayer hall. The Aghtsk royal sepulcher, despite its characteristics, has a great similarity in structure with both the Roman-era monuments of Assyria and the simultaneous monuments of Armenia (Early Medieval sepulchers of Ani, Kamaris). Continuing to Amberd fortress which is one of the most famous castles and fortress-towns in Aragatsotn region of Great Armenia’s Ayrarat province , located 5-7 km south-west from Byurakan village in Aragatsotn Province, on the north-east slopes of Mount Aragats. It’s nestled on a plane surface of the high triangular promontory (2300 above sea level) formed by the rivers Amberd and Arkashen. According to the traditional etymology Amberd means «adjacent fortress», «without a fortress» or «fortress of cloud height». There have survived ruins of Cyclopean constructions in the territory of Amberd, as well as dragon stones in the surrounding area. The construction of the fortress was set off in the 7th century by the efforts of Kamsarakan princes. Later, it became the property of Bagratunis , then of Pahlavuni dynasty. In the 11th century the Seljuk Turks conquered Amberd. Zakarian brothers liberated it in 1196, handing it over to Vachutyans, who made it their residence. 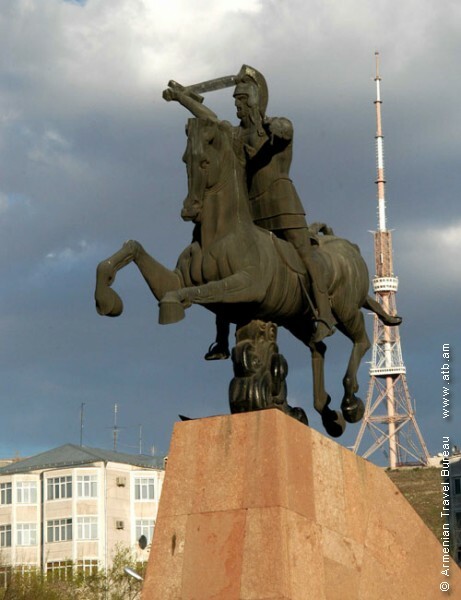 In 1236 Amberd was conquered and demolished by the Mongols and became definitely deserted during Tamerlane’s invasion. At the end of the 14th century the ruins of e ramparts, royal two-storey palace, the church and the bath-house have still survived, the part of which are presently reconstructed. The natural position of the castle was well- fortified by walls and pyramids. The castle and the palace had their separate ramparts with two-storey towers. Besides the main doorway, the castle owned two secret ways leading to the Amberd canyon. 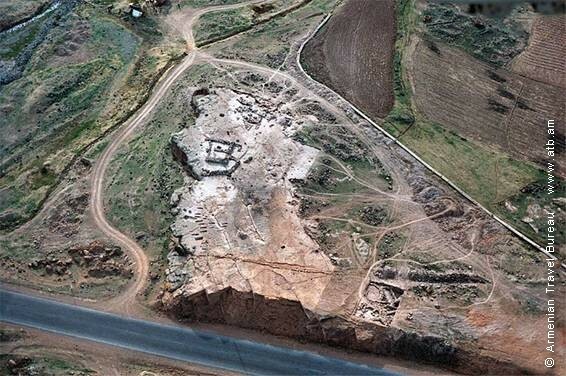 The palace with its predominant position over the castle had an area of 700 sq. 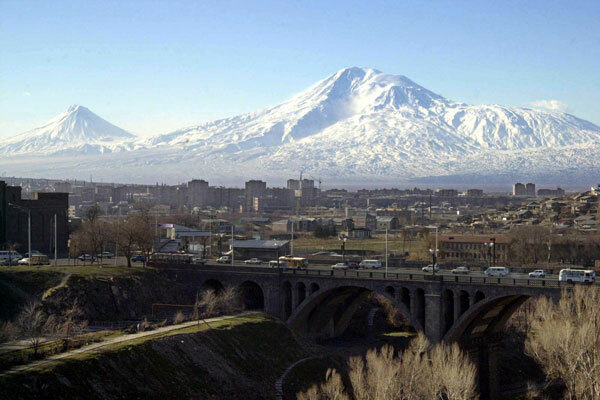 m. The surrounding gulfs, the ramparts (15 m. high, 2 m. wide) made it inaccessible, the north-west windows of which faced the magnificent landscape of Ararat valley. The palace was a two-storey construction with high walls. The first floor included subsidiary rooms, while on the second floor there were dwelling rooms. One could go upstairs by wide and solemn stairs. On the first floor, to the right of the staircase there was a special pool to supply the palace with water. The principal church was established by the order of Vahram Pahlavuni Prince in 1026, similar to Marmashen church in its design. The church is rectangular from the outside, while from the inside it’s a cruciform, domed-hall construction. The drum of the cupola is polygonal with double pillars in corners and is crowned with umbrella type steeple. The arched entrance is decorated with colonnades. On the inside wall there is a record on its construction. There is a well-preserved bath-house (10-11th cc.) next to the princely palace with adjacent equipment, reservoirs, and boiler –rooms. The bath had a rectangular plan, composed of successively adjacent cloak-rooms, bath-room, heating- room, roofed (the first two) with garret-window. The bath heating was realized from the bottom and by means of vertical tubes installed inside the walls, which got the heated air and steam from the hearth. The water reached Amberd by clay tubes from 5km distance. The water supply line first entered the palace, then flew into the inner part of the castle, where there was a capacious pond constructed not far from the palace. It was from here that the bath-house and the whole castle got the water supply. 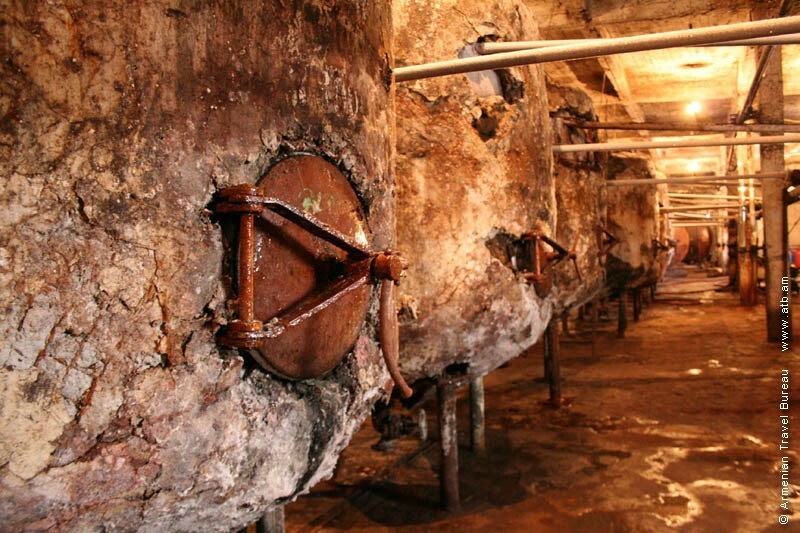 The tubes inside the bath-house were of metal. 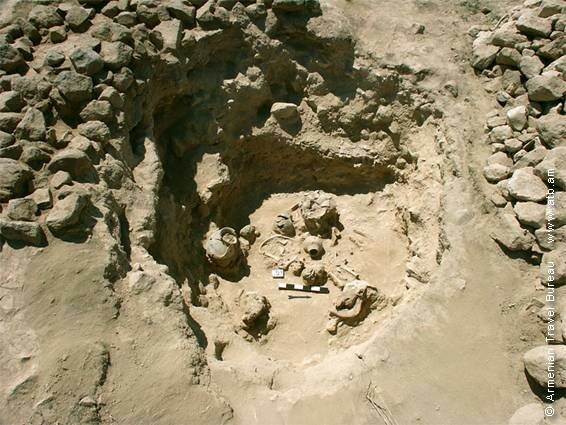 The first excavations of Amberd were completed by H. Orbeli in 1936, later in 1936 the excursion group of the RA Institute of Archaeology and Ethnography went on with the started excavation. Setting off to the territory of the ancient settlement of Agarak. Participation in excavation of Agarak. The site consists of horizontal flows of solidified tuff, which extend southward and have flat surfaces. They border on the East with the river, while in the West they turn into a hilly ridge. Taking into account the special characteristics of the local relief, formed by tuff flows, the inhabitants transformed the landscape, turning natural masses of tuff into a gigantic system consisting of collections of stone structures. Downstream along the course of the Amberd river for dozens of kilometers extend without a break tuff cliffs, passages, rocky hills, and natural plateaus, as well as freestanding blocks of stone. On their surfaces and sides, these formations bear the traces of intensive stone working. The sides of the cliffs and plateaus have also been carved. There are niches carved into the cliffs, as well as stair-like platforms leading to them, in addition to the structures of other types. All of these structures, including an unbroken series of round, horseshoe-shaped structures and channels linking them, plus trapezoidal "sacrificial altars," transform the natural landscape into a gigantic monument. This ensemble of cultic structures is complemented by artificial constructions located around the plateaus and in the spaces between them. Stratigraphical observations indicate that this ensemble of cultic structures and courtyards was created in the Early Bronze Age. 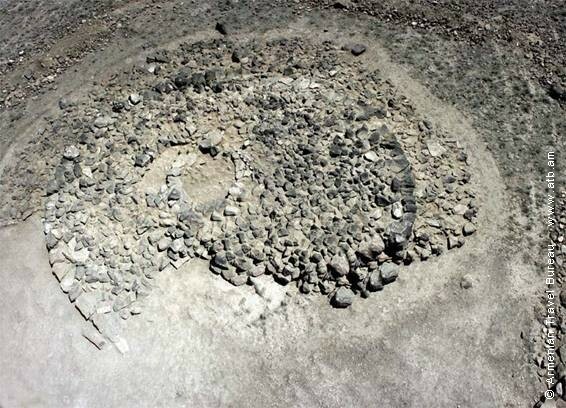 The results of field investigations in 2001-2002 show that Agarak was settled starting in the early Bronze Age. The street discovered at the northeast edge of the first plateau, and the presence along both sides of the street of dwellings with rounded plans and square annexes, indicate that, in the early Bronze Age here existed a town with a regular street plan. 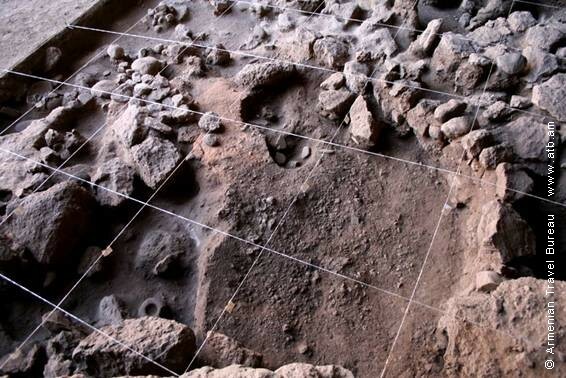 Most likely, the basic compositional elements of the town plan in the early Bronze Age are the rocky platforms carved on top of the cliff, around which extended living quarters. 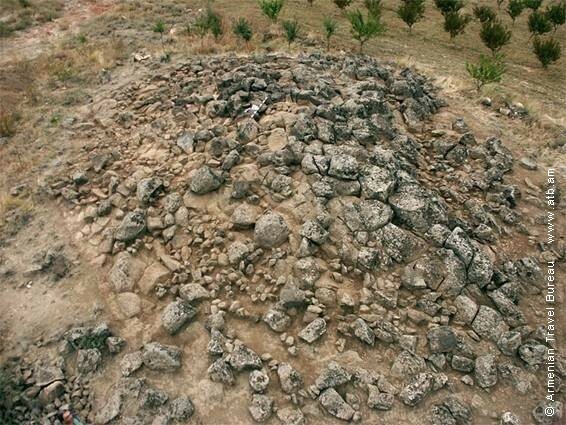 During the process of the excavations, the discovered enormous quantity of ceramic fragments, terra cotta statues, round and horseshoe-shaped portable hearths, and hearth stands, permit us to date this section of Agarak to the middle cycle of the so-called Shengavit or Kura-Araxes archaeological culture, which is nowadays dated to the 29th through 27th centuries BC. 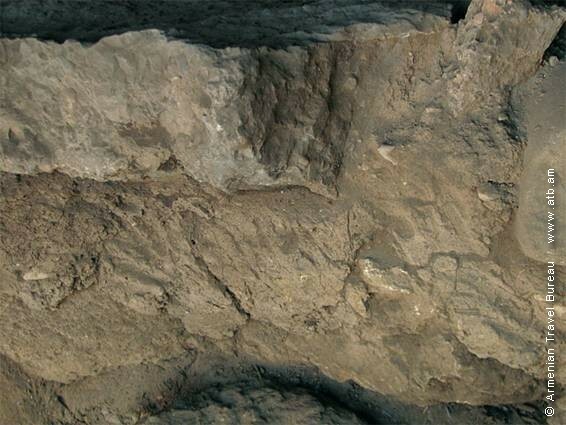 The layers overlaying the strata of the Early Bronze Age are disturbed. 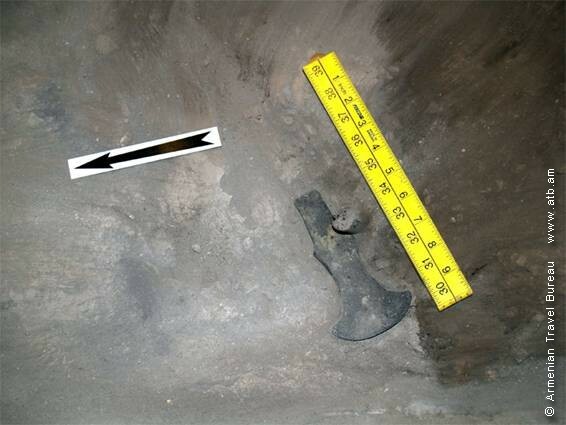 They contain material remains confirming that the site was subsequently inhabited in various archaeological periods, from the middle Bronze Age to the early Iron Age, inclusive. A “karas” (pythos) burial with an Urartian seal and the presence of many Urartian ceramic fragments permit us to speak as well of Agarak being inhabited from the 8 th to the 6 th century B.C. 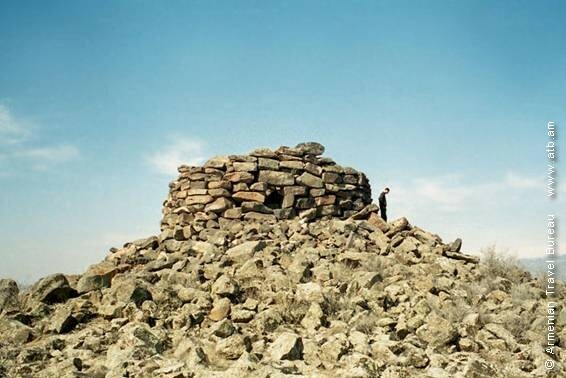 In 2004 there was discovered a unique model of Urartian sepulchral architecture on the southern cliff plateau. It’s a columbarium carved into the tuff cliff. The north (towards M. Ararat) facing entrance has been covered by a huge tuff slab. The sepulchral hall of 9qm size includes cliff carved chambers in both sides- in the façade, as well as chambers for a corpse receptacle and a sarcophagi basin. 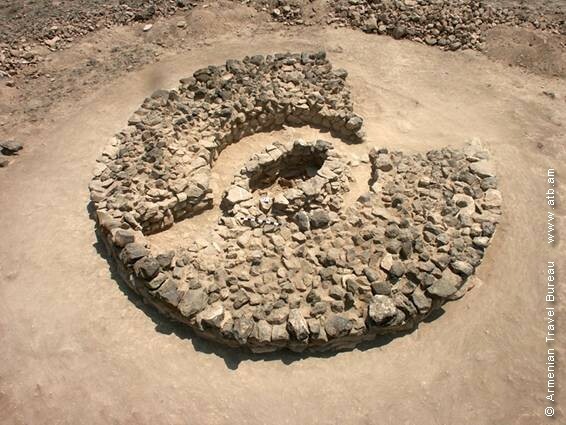 Within the limits of the Armenian Plateau and the territories bordering on it, this find is unique among the structures of the same kind, having parallels with the famous examples of Van. 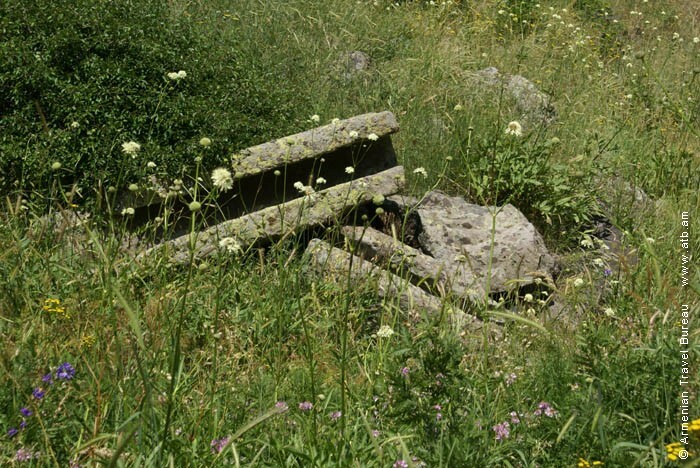 The columbarium has been robbed by the Hellenistic period population, who has had funerals in the same area, yet the exploration of the territory permits to suppose the further discovery of similar structures here. After the fall of the Van Kingdom, Agarak experienced yet another period of intensive development, becoming a large settlement of the urban type. 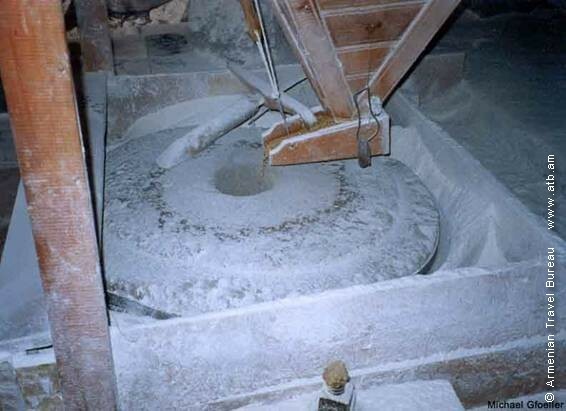 The large quantity of wine presses and wine storage vats discovered in the excavated sectors indicates the predominant role of viticulture and winemaking in the economic life of the inhabitants of Agarak. As one of the most important points along the trade route leading from Airarat to Shirak and capital city of Ani, Agarak developed a flourishing economy and commercial sector, especially in the 3 rd and 4 th centuries BC and in the 2 nd through 4 th centuries AD. Evidence of this development is provided by the discovery of painted urban pottery, drachma of Alexander the Great, a silver denarius of Octavian Augustus, and several signet rings found in sarcophagi burials belonging to the Late Antique period of the site. 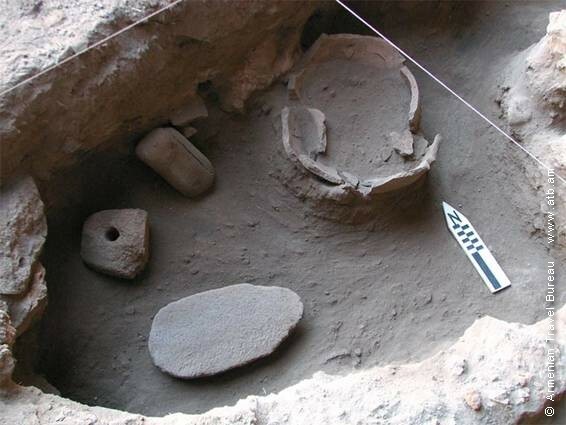 The discovery of modest amounts of glazed and cooking pottery in the alluvium layer covering the plateau's Antique strata indicates that life continued at Agarak in the high middle Ages (12 th to 14 th centuries). The final phase of the history of Agarak's inhabitation is represented by typical materials of the 17th and 18th centuries (ceramics, hearth bases, coins issued by the Khanate of Yerevan, etc.). The present utilization of the site can be understood only in the light of its entire historical development. 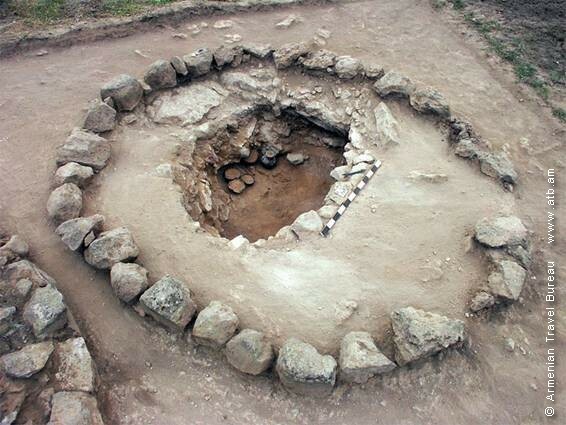 Generally speaking, the ancient settlement of Agarak is one of the best archaeological monuments in Armenia, represented in open-air templar complexes («Ritual landscape»), which, practically, reveal all the stages of material culture development dating from the early Bronze Age to the late Middle Ages. Lunch. Going on with the excavation. Breakfast. A trip to Agarak settlement. Continuing with the excavation work. 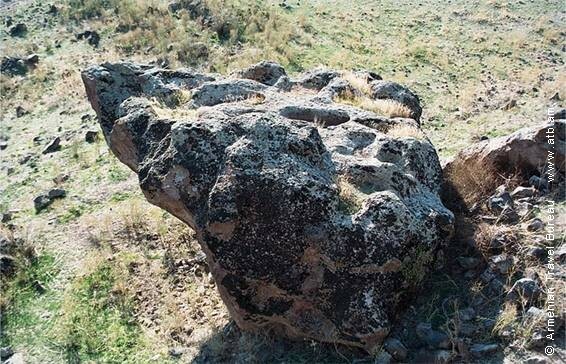 Archaeological trip to Aghavnatun village to see the tomb field, which is situated to the north-west of Aghavnatun village in Armavir region, in the southern foothills of Mount Aragats, approximately, in the joining point between Mount Aragats and Ararat valley. 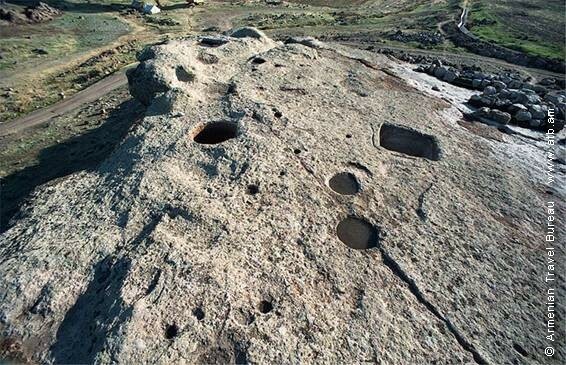 It’s one of the largest tomb fields in Armenia, where besides burial structures of different periods, there are also preserved inhabitations, edifices of ritual significance, remains of towers, petroglyphs. The excavations of the tomb field started in 2002 by the efforts of the expedition of the Institute of Archaeology and Ethnography. About 100 constructions have been explored so far. Those date to the 23-22th through 11-9th centuries BC or from just so called initial stages of the Middle Broze Age to initial stages of the Early Iron Age. 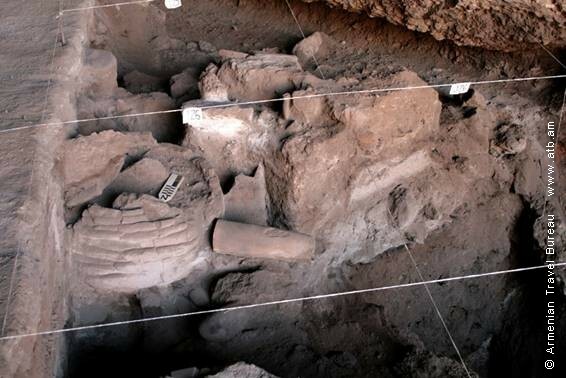 These burial constructions are distinguished from each other both in their structure, size, constructive characteristics, and in the variety of the burial accompanying goods: the details of the burial ritual. They are represented both by the burials done on natural cliffs and by cell slab-shaped large and small sepulchers framed in a stone circle. 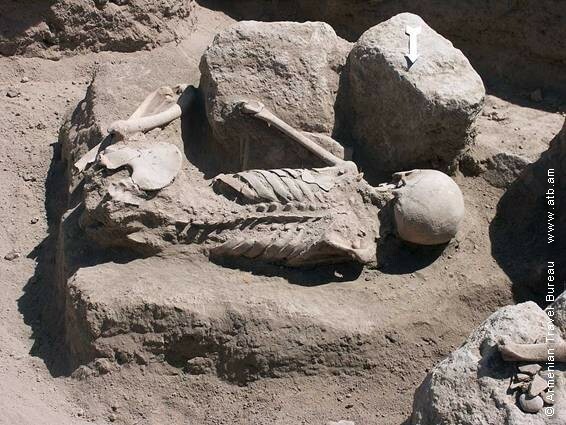 There are also surface burials. 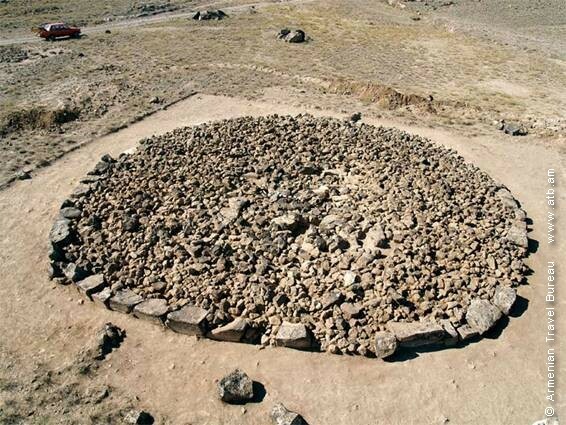 The burials of the tomb field belong both to common people and to the individuals with high social status, as well as to the cult animals – representing the details of the sacrifice. Among the various excavated artifacts there are simple remains of material culture for daily use, such as pottery, bronze and iron jewels (earrings, bracelets, rings, buttons), as well as objects of luxury used by the creams of society, like armaments, decorations, jewels, string of beads made of various colorful stones, wonderful examples of pottery of ritual significance, made with the help of different technological methods. The part of these objects delight with the skills and taste of the masters making them. 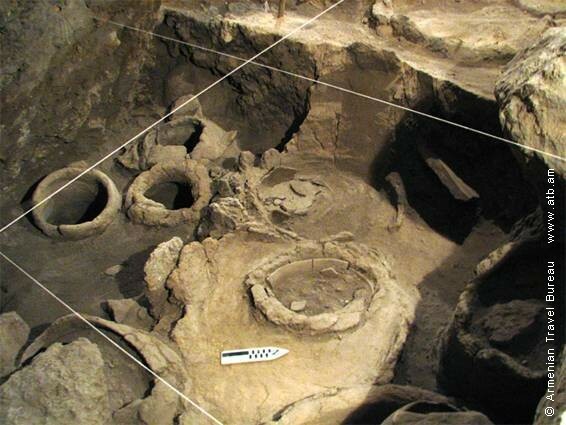 The major part of the burials is of 3-5 meters in diameter, but there are also monumental constructions among them of 10-18m. in diameter, that reveal the attitude and respect of the ancient societies in satisfying the sepulchral requirements of high standing individuals. The rest of the sepulchers has traces of plunder and re–burials. There still exist hundreds of unexplored burials in the tomb field, which are waiting for their turn, the moment when the specialist’s pick will clean out the individuals’ history and destine of travelling to the next world, held in dust and soil. Lunch at noon. Going on with excavation. Leaving for Aghavnatun village to continue with the started excavation of the graveyard. 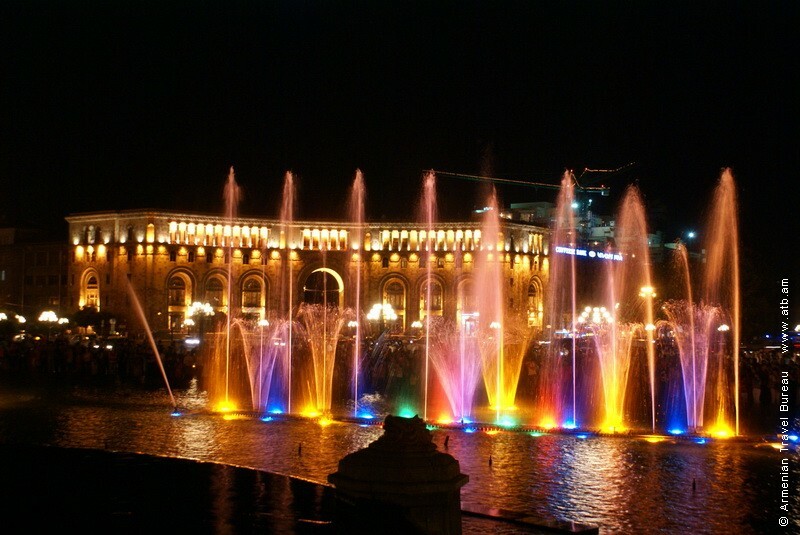 Back to Yerevan in the evening. Overnight in hotel. Breakfast. 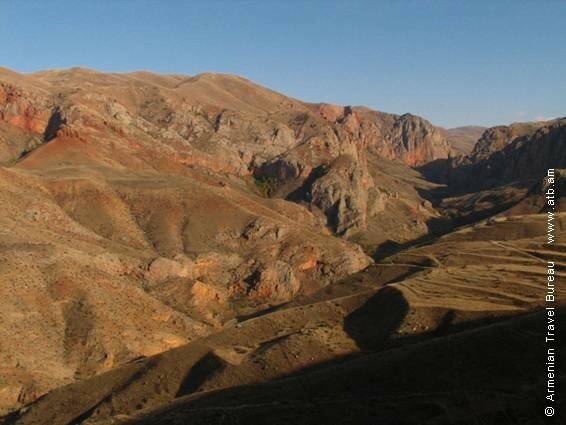 Trip to Areni village to participate in the excavation of Areni 1 –cave. Areni village in Vayots Dzor province is one of the oldest and outstanding settlements in Vayots Dzor province of Syunik Marz in historical Great Armenia. It is located on the right bank of the river Arpa, on the rim of its gorge, crossing which the river flows through a narrow canyon out in Sharur valley. In other words the settlement has been a road junction and military point protecting the canyon between Sharur valley and Vayots Dzor. That’s why in the ridge around the village (in the gorge of Amaghu) there was once a fort – castle, which ruins still survive. The village has been mentioned by Vth c. A.D. historian Yeghishe as Arpunjal, Arpanjal (Arbanjal –of Arpa). 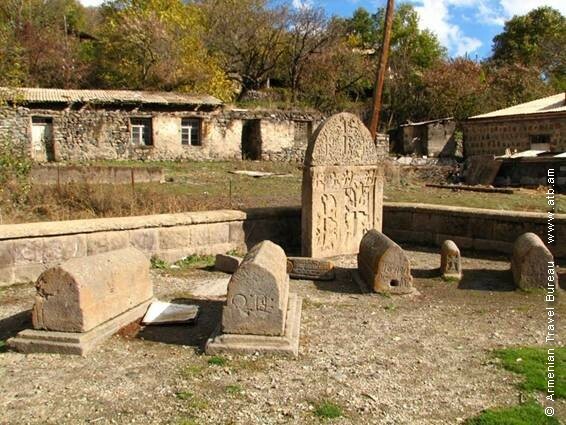 In the past Areni was situated on the left bank of the river Arpa, on a high hill, where the ruins have been preserved (now it’s the village cemetery). 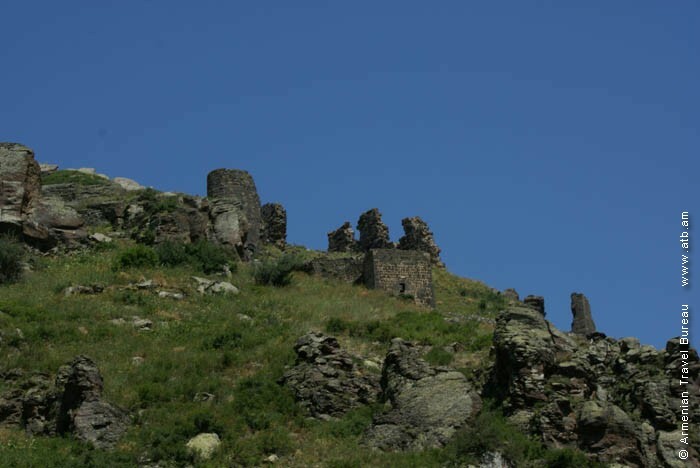 In 13th c. principal Tarsayich Orbelian constructed a palace and made Areni a ‘nstoz’ (residential) fort, moving here the Syunik resident centre from Yeghegis. By his order the head of Noravank – Bishop Sarghis (1265 – 1287) built a three-arched wide - spanned bridge, only the baseof which has survived. 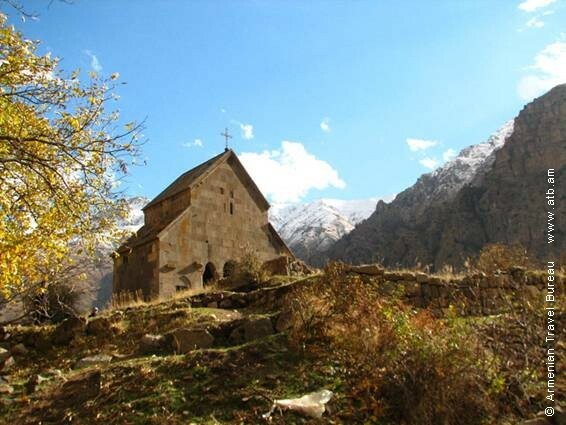 In the southern side of the old village, near the ruins is also located St. Astvatsatsin church of Areni which was built in 1321 by request of Bishop Hovhannes. 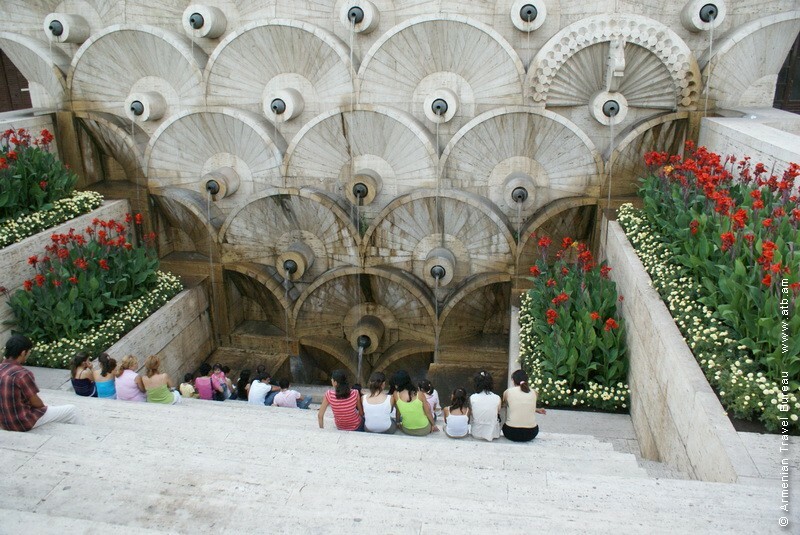 The architecture as well as the carvings are the results of the work of famous architect Momik. There is a bas –relief of the Holy Virgin with the child on the south entrance tympanum of the church. 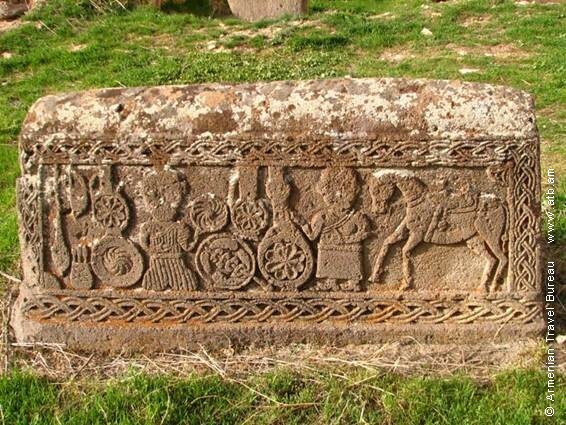 The village area – environment is rich with various archeological monuments: cave - dwellings, castles, remains of medieval villages-settlements, separate khachkars, cemeteries, chapel- sanctuaries, e t. c. Among these Areni-1 cave is of great significance. 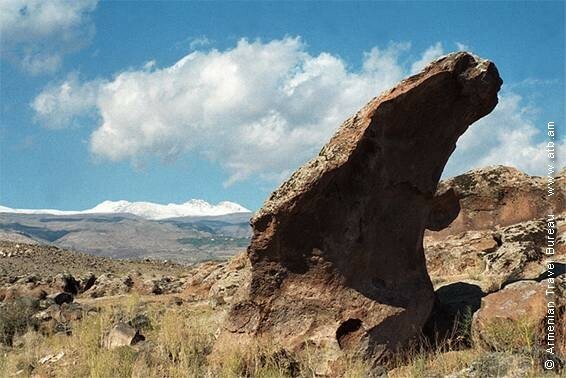 The monument is to the west of the village, on the left bank of the Arpa, on the high rocky formations to the right of Noravank leading road. It’s a karst three-hall cave, which was formed in the rocky limestone formations spread in the Arpa gorge. Due to excavations carried out here in 2007-2008 it became quite possible to discover remains of material culture belonging to The Copper and Stone Age. Particular interest arouses the complex preserved in the first hall of the cave. It is of industrial-economic significance, composed of affiliated mud structures. This complex includes various jars, small and large troughs, barrels and other substructures for food production and storing. The wine-press is of great interest, from the adjacent plots of which there were found grape vine and pit remains. On the whole, the analysis of the excavated pottery and its sherds, the metal and stone artifacts and cloths, plant seeds and other objects of organic origin permit to date them from the end of V millennium B.C. to the first half of the IV millennium. 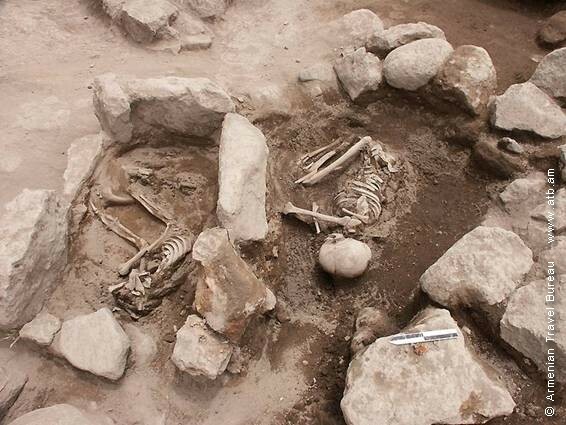 Here there are also under age women’s ritual burials, which possibly reflect the ancient ideas connected with fertility cult. 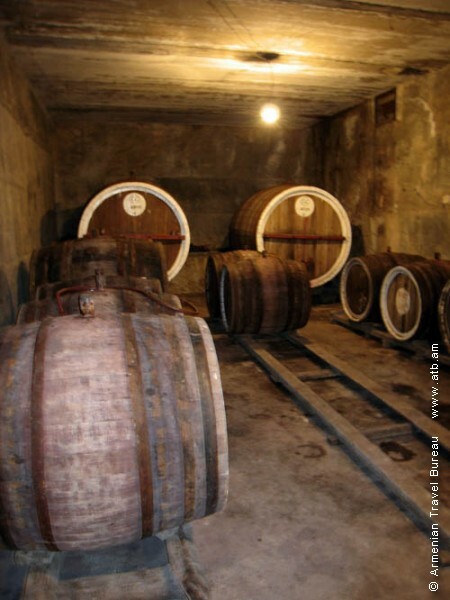 Taking into account the fact that this area (the vale of the river Arpa) owns a traditional wine-making, coming from centuries profundity, a conclusion might be made that in case of Areni-1 cave, we deal with the origin source of Armenian wine-making culture with more than 6000-year history. Lunch at noon. Going on with the excavation. Back to Yerevan in the evening. Supper. Overnight in hotel. 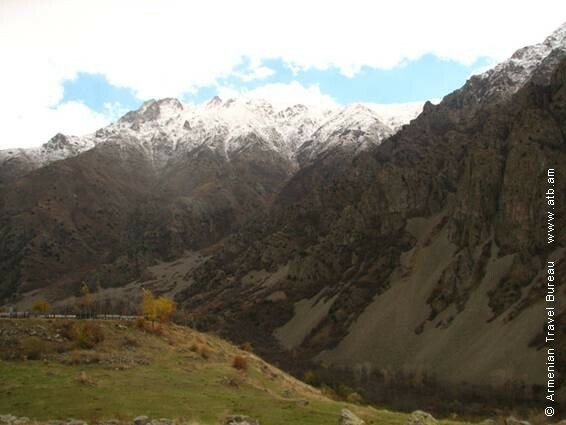 Proceeding the route of the previous day to Areni village. Going on with the started excavation. Back to Yerevan. Supper. Overnight in hotel.